On time performance: 4 out of 8 flights were exactly on time. Remaining 4 had minor delay ranging from 20 to 50 minutes. Fairly reasonable. No major problems. From what I noticed, most flights in Philippines- those of Philippines airlines and Cebu Pacific included were largely on-time when I was at the airport boarding gates. Seats: AirAsia assigns a random seat during check-in. Change of seat costs money. I got window seat 4 out of 8 times, middle seat once and aisle seat remaining 3 times. My sequence number was within first 15-20 most of the time and my seats were around row 22-24. My guess is seat assignment begins from middle of the plane. AirAsia hopes that some people will pay and upgrade to hot seats in the front. On one of the flights my seat had reclining problem but I didn't want to lose the window, hence managed in that seat for an hour without asking for seat change. I badly missed the window seat while flying into Puerto Princesa. But below are some photos clicked from my window seat of Air Asia flight, of places in Philippines. Most flights were full. International flights were filled to the last seat. Domestic flights within Philippines had few empty seats. Obviously AirAsia group is doing great in terms of load factor. Good for them. I could manage without a check-in bag on this trip. Had to ration every item I wanted to carry but in the end it was very convenient to move around. If I had to buy minimum allowed check-in bag (20kgs) I had to cough up INR 6000+ which is almost half of my ticket price (Chennai-Manila n back). I am planning my next trip also same way. Tip/Caution: Be very careful in KLIA2 to be at your gate on time. There may not be announcements calling for you. Well ahead of time passengers are ushered into a pre-boarding chamber and gate may close on time, even though actual boarding hasn’t begun. If you wander around and fail to get into pre-boarding area, you might end up missing your flight. A friend missed his flight this way- as he was waiting little away from the gate (as all seats near the gate were taken) and didn’t realize that gate is closed. Had to buy new ticket. Above: full body advertising on the plane- another way to make money. In a surprise move, Air Asia has announced its first flight to US soil, Hawaii islands off US west coast. This will be via Osaka, Japan. This is great news but has some challenges at present. 1. Chennai to Honolulu and back is about 70k under for select dates if booked months in advance. This is still cheaper than other airlines by about 20-30k if your objective is to go to Hawai directly. But if your objective is to enter US via Hawai and then go to mainland, then Air Asia may not be best option. Honolulu to San Francisco or Los Angeles return will cost about 25-30k INR. It is cheaper and time saving to fly direct to LAX or SFO using conventional full service airlines. Hopefully Air Asia will start flying to US mainland soon. Honolulu is to Americans what Maldives or Andamans is to Indians. If you’re bored of the mainland, you hop on a flight to Hawai to have a break amidst the ocean. From India going all the way to Honolulu for beach vacation doesn’t make sense. But if you’re planning to go US mainland anyway, then going to Honolulu via cheap AirAsia ticket and then continuing onward to mainland might be an option worth considering, if you’re fine with long travel time. Note that Indian Nationals will need Japan transit visa to connect via Osaka- transit visa takes about 3 days to process and a few hundred rupees if you live in a city that has Japanese Embassy, more if not. Also factor INR 10-15k towards check-in bag charges. It is very unlikely you can go all the way to US with one 7kg hand bag. There was some news of Air Asia flying to Russia. [news] Couldn’t see it happening yet. But Air Asia is already flying middle east to Mauritius, Jeddah and Tehran in the west (in addition to NZ, Japan and US on the east). They are on a roll and spreading wings. Best wishes to them. 2 Chennai domestic flights discontinued. Air Asia India has stopped flying to Chennai. The reason is unknown. They were flying Bengaluru-Chennai for as late as Kabali movie time. But now Chennai doesn’t even appear on Air Asia India’s network. May be because of poor load factor? (Not many prefer to fly Chennai-BLR because Shatabdi is more economical and practical than flight from a door to door perspective. Air Asia was not offering connecting flights via Bengaluru (I couldn’t book Chennai-Pune via BLR though it was same aircraft) Whatever is the reason, it is unfortunate they have omitted Chennai. When asked on twitter, I didn’t get any reply why. Anyway, Air Asia Malaysia continues to fly to Chennai and that is good enough for me right now. 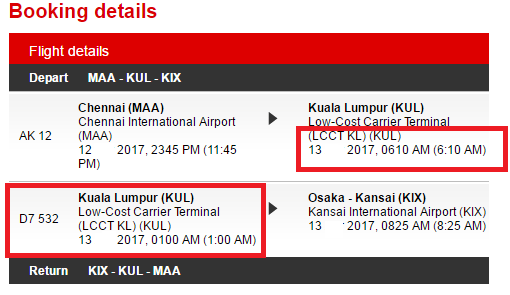 For my Japan travel, Air Asia had issued a faulty ticket that needed me to time travel. I was to arrive at Kuala Lumpur at 6 AM but catch a connecting flight at 1 AM, going back in time by 5 hours. When I brought it to their attention, I asked for a sector change- instead of Osaka I can take next flight to Tokyo without having to lose a day. But Air Asia refused sector change. They have also canceled Chennai-Kuala Lumpur flight on the date of my departure, so my only option was to reach Kuala Lumpur one day earlier- I need to lose another day of leave because of this, spend a day in travel and transit. No compensation, no upgrade, no apology nothing. If there was any mistake on my side, I have to pay in cash. If there’s a mistake on airline’s side, we should be lucky to be accommodated somehow and not supposed to ask any compensation. Looks like AirAsia has started deploying some cookies based software code on its website to discourage people from playing around on the website too much to identify cheapest possible fares. People like me try 100 combinations before identifying and booking on cheapest rate. They probably want you to book in first few attempts. I got below screen for the first time as I was checking for what dates Honolulu flight is cheapest. I was told (by air asia twitter handle) it will work if I try in a different browser or by clearing cookies. If I can’t convince myself that what I see is possibly the cheapest, I won’t have the confidence and satisfaction to book. I am not sure what AirAsia will achieve by deploying this kind of code. It might work sometimes on those who desperate to book, but never on opportunistic travellers like me who book only if we see a really tempting fare. You can also refer to my post on Air Asia Benchmark pricing to know what is low fare and what is not. In the in-flight magazine I could read about Air Asia’s new global headquarters near KLIA2. Named Red Q, the office building is custom built to offer space and uniqueness. With lots of open space, creative interiors it is sure to be an inspiring space to work for Air Asia staff. AirAsia now connects Bhubaneswar to Kuala Lumpur, with a launch fare of Rs 3999 for BBI-KUL return. Now costs about 15k. Good to see AirAsia Malaysia connecting more and more Indian cities. It is interesting to see how connecting destinations vary based on Origin city- Some of the cities you can connect from Kochi can't be reached via many other cities in India. May be transit time considerations. Overall the experience has been fine. I have few more flights lined up this year. Let us see. Thanks for the comment. Hope you got new spectacles now. Well structured and detailed article supported with artifacts. Enjoyed it thoroughly. Nice information . Good . Nice information and review . Thanks Hema, Yogi, Mamta, Chandra Shekhar.